Author: Richard Fry, researcher at Pew Research Center. 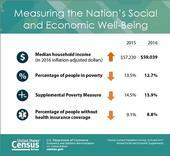 The U.S. Census Bureau announced today that real median household income increased by 3.2 percent between 2015 and 2016, while the official poverty rate decreased 0.8 percentage points. At the same time, the percentage of people without health insurance coverage decreased. Median household income in the United States in 2016 was $59,039, an increase in real terms of 3.2 percent from the 2015 median income of $57,230. This is the second consecutive annual increase in median household income. Latinos are twice as likely to live in poverty as white residents in Sonoma County, where one in five Latinos live at or below the federal poverty level in the aftermath of the recession, according to new estimates from the U.S. Census Bureau. During the five-year period ending in 2014, an average of 19.6 percent of Latinos in Sonoma County lived at or below the poverty line, compared to 9.3 percent of white residents. 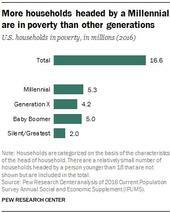 In 2014, the federal poverty level was $14,580 for an individual and $29,820 for a family of four. The nation's Hispanic population has long been characterized by its immigrant roots. But as immigration from Latin America slows, the immigrant share among each of the nation's Hispanic origin groups is in decline, according to a new Pew Research Center analysis of U.S. Census Bureau data. Hispanics account for the majority of U.S. population growth, with nearly 25 percent of all infants now being born to Hispanics, according to a new report from the University of New Hampshire's Carsey School of Public Policy. With Hispanics driving population growth, the Carsey School researchers highlight that Hispanic infants are nearly 2.8 times more likely than non-Hispanics to be born into poverty.